The arrival of Yamaha’s MusicCast multi-room system was like the first drop of water in a parched landscape, for legions of Yamaha fans, who resisted the temptation to bite the bait with Sanos. They were ten years behind but managed to scale the gap more or less, by integrating the technology into most of their product range including receivers and powered speakers. That places them in a strong position to challenge the supremacy of other brands like Denon and Pioneer, which were fast gaining traction. 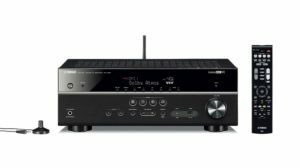 And challenge they do with the Yamaha RX-V581, which is one of their best AV receivers to come from their stable in the past couple of years. It boasts of enough features to impress even a discerning audiophile. Along with the MusicCast, highlighted in bold are Dolby Atmos, DTS:X and full 4k support. But coming from Yamaha, the sheer pleasure of owning one of these beasts comes from the sublime sound quality. Aesthetics are the least of Yamaha’s concerns because they retain the fascia panel that most people are now familiar with. Unlike some of the other receivers which have a minimalist approach, Yamaha goes the old tried and tested way with buttons for accessing most of the controls. The most often used ones get dedicated shortcut buttons. The high definition screen is a welcome change from the old 480p models, and hence navigation is a breeze. The remote control looks like its straight out of the RX-V479, but it’s a more stripped-down version that’s easy to figure out. Also, you can always use Yamaha’s AV Control app (available on both Android and iOS) to customize the DSP settings and the listening modes. 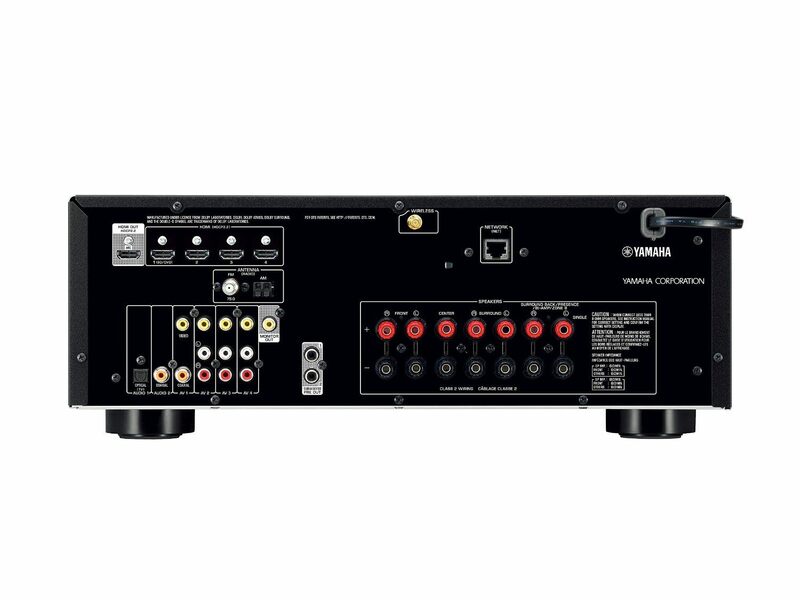 On the connectivity front, the Yamaha RX-V581 lacks the component inputs that made the RX-V479 such a versatile amp. The six HDMI slots are reduced to four which are HDCP 2.2 (4k Blu-ray) and HDMI 2.0 compliant. It loses brownie points due to the lack of legacy connectivity options, which are sparse. Setup: Setup is as hands-free as they come. The YPAO calibration system quickly connects to the speakers and measures the acoustics. You don’t need to move the mic around either. The complete thing takes less than five minutes. Connectivity: Wi-Fi setup on the RX-V581 is as easy as it can get if you have an iOS device. It directly copies the Wi-Fi settings from the device and eliminates the need to tinker with the settings. Even if you do not have a wireless network at home, you can use the built-in ‘Wireless Direct’ feature to connect to the Yamaha Control app. Streaming: While MusicCast is making steady upgrades to their services, it still has a bare minimum. Your choices are Spotify, internet radio, Rhapsody, and Pandora. DLNA compatibility allows you to stream music from your phones, network devices, and Apple Airplay. Lack of Google Cast support hurts Yamaha slightly, but it becomes the first receiver in the market currently to offer Qobuz compatibility. Multizone: If the multi-zone is what fascinates you then you will be pleased to know that the RX-V581 can play 5-channel audio while sending 2-channel audio to another room, but only if the second one mirrors the main room. While the output of the RX-V581 is similar to that of its predecessors (80 watts/channel with 2-ch at 8 ohms), the Dolby Atmos and DTS:X make it an entirely different beast. It handles bass way better than other mid-range receivers and the low ends especially, offers tremendous depth. At the same time, it’s not an overkill that drowns other frequencies. The Dolby Atmos will engulf you with clear and transparent sound, making you feel that the action is believable. Crank up the volume to the max and, it does not falter one bit— no strain in the quality or detail. Overall, it is a strong contender at this price point and delivers a solid performance that does not disappoint. Is this a good choice for my home? It certainly is. The Yamaha RX-V581, when clubbed with a quality home theater system, will offer near-flawless performance that will leave you impressed. Unless you fuss over the lack of two connectivity options or the incompatibility with Google Cast, it is a great buy with a very modest price tag. And hey, it’s a Yamaha.